Robert Carnilius, 26, created the animated web series "McTucky Fried High." UPTOWN — Once Columbia College Chicago grad student Robert Carnilius noticed that cartoons don't tackle issues LGBTQ teens face in a real way, he decided to take matters into his own hands. "There weren't any prominently featured LGBTQ [cartoon] characters," said the 26-year-old filmmaker and illustrator. "If there were, they were very cartoony and based on stereotypes." In attempt to change that, Carnilius created the web series, "McTucky Fried High," a fictional cartoon where high schoolers, who are portrayed as humanoid food items, deal with bullying and gender identity, among other things. "With human characters, we tend to put a lot of ourselves in them and it's hard if you don't the certain mold," he said. "By having the characters be food items, people won't have preconceived notions of who these characters are and they can see themselves in the characters." 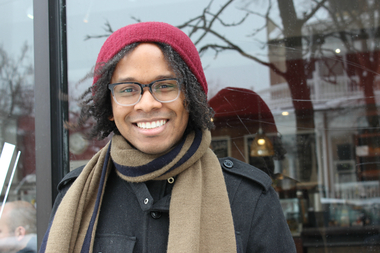 Carnilius, who has lived in Uptown for the past few years, was one of 12 filmmakers to win a grant from Chicago Filmmakers through last year's Chicago Digital Media Production Fund. Using the $6,700 grant, his team was able to make five episodes, which will be released bi-monthly. The first episode was released Jan. 26. In it, McTucky students accuse their friend Henry, a cartoon hot dog, of being gay. While Carnilius came up with the idea during a motion graphics class in the summer of 2013, it wasn't until March of the following year that he won the grant and was able to hire animators and voice actors to bring his series to life. That kicked off a long process, in which his team animated the series, recorded the voice-overs and completed the sound design, he said. Every episode, he said, tackles issues he's "dealt with in one way or another." As a teenager, he didn't openly identify as gay and was picked on for the way he dressed, he said. "I grew up in a very religious and military home," Carnilius said. "I was depressed and trying to reconcile my shame for being gay." In the series, characters struggle with gender identity, sexting, bullying and more. Carnilius' overall goal, he said, is to invite teens, parents and teachers to have a conversation about the issues teens face. "I hope that teens see themselves in a positive way through the animation," he said, adding that he wants parents and teachers to better understand some of these issues so they realize "there's nothing wrong with their kids." "A lot of times it's not bullying [from other students], it's parents or other authority figures causing harm to teens who need support and a safety net." He hopes his humorous approach "can change things" while also bringing a lightness to serious issues. And so far, he's received "extremely positive" feedback with the exception of a few negative comments, he said. "It is very layered so I love when people are able to break it down and examine it and enjoy the different things that are going on," he said. Rather than engaging with bullies of his past, Carnilius used his upcoming 10-year high school reunion as a way to reflect on how far he's come. "Sometimes it's the hard times in our lives that make us stronger and reveal who we are as activists," he said. "If it wasn't for all of the backlash and homophobia and racism, I don't think I'd be the person I am today. I'm just hoping to make it a little bit easier for the young 'n's coming along." The second episode of "McTucky Fried High" will be posted on YouTube Monday.